Have you ever built a deck that is very consistent? In some situations this is a positive goal to reach with your deck design. You crafted the list so well that it is able to execute it’s primary objective mostly every game. However, for me, high consistency can grow dull when it is fairly linear. 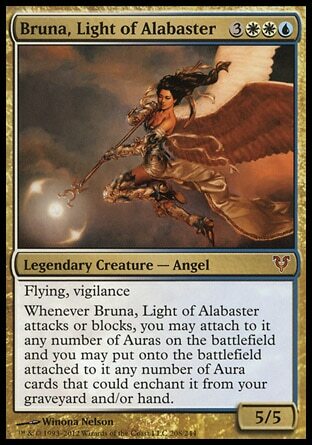 For awhile my favorite commander was Bruna, Light of Alabaster. She provides a very powerful end-game to the u/w control deck I crafted around her. Unfortunately after many games of her following the same path to victory my favorite deck fell out of favor and became stale like a box of cereal that was left open. Luckily Theros and Born of the Gods recently swooped in to save the day to do a total Extreme Makeover Theros Edition on her. Read on to see how the new block inspired changes to my once-favorite list. U/W control is one of my favorite archetypes, so when Bruna was first spoiled it was a match made in heaven. Not only was she in a great color combination, but she provided a robust mechanic for finishing off games. I was able to take the pieces from an older 60 card Eldrazi Conscription deck and craft it into a fresh commander list. In my first version of the deck, the goal was to set up in the early game and try to prevent someone else from winning at least until turn 6 or 7. By this time hopefully I had enough pieces to assemble a hasty bruna one-shot machine. Unfortunately over time I found I was winning in a very similar fashion time and time again. I would counter a few key spells early game, then tutor for some auras like Battle Mastery and Corrupted Conscience. At that point it was a matter of one shotting my way to victory. I was able to tailor her protection with cards like Indestructibility and Elgaud Shieldmate. Bruna eventually got played less and less and she developed a “been there, done that” feel. 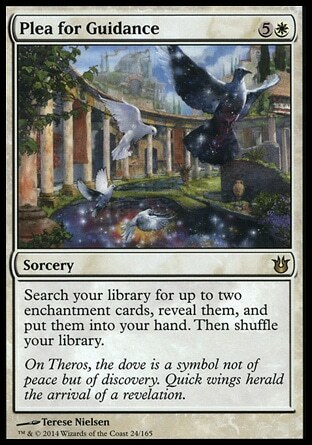 Just as I began contemplating sending Bruna to the chop shop Theros block was released. As I looked through the Brand new mechanics such as Heroic I began to realize their might be a new direction I could go with Bruna. I decided she might not be dead yet, in fact she might be getting better. The new plan was to pull the deck apart and reconstruct it with more of an enchantress style theme as opposed to the previous more control-centric strategy. To get things started I had to figure which parts of the deck would carry over and which parts would get cut. Cuts: As you can see in the 1.0 list I had a decent amount of artifact support with cards like Tezzeret the Seeker, Mana Vault, and Trinket Mage. My new strategy would be much more enchantment focused, so these artifacts had to go. Artifact based control like Crystal Shard also gets cut in favor of a more enchantment centric design. Other cards, such as Consecrated Sphinx and Sakashima the Impostor also got the boot even though they were powerful, they didn’t synergize well with the focus of the new deck. 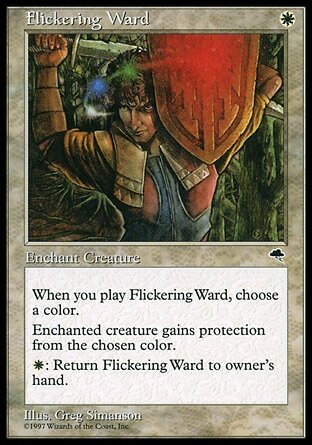 Flickering Ward: Not only does it enable you to reset your protection color, but this aura bounces itself, so you can chain a bunch of Heroic triggers all off of the same aura. Once Bruna hits the board the ward is still valuable since you can give her protection from black, green or red. 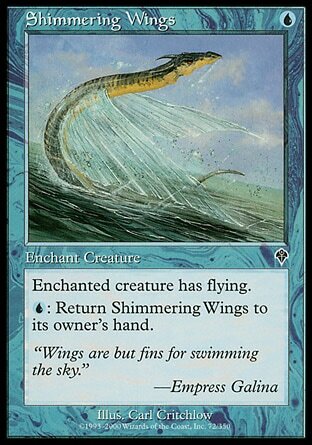 Shimmering Wings: I never knew I’d be trying to use Shimmering Wings in any deck ever, but it is actually pretty functional here. It allows me to grant a card like Fabled Hero evasion and also pump him up to scary proportions all with a little junk card from the Invasion block. 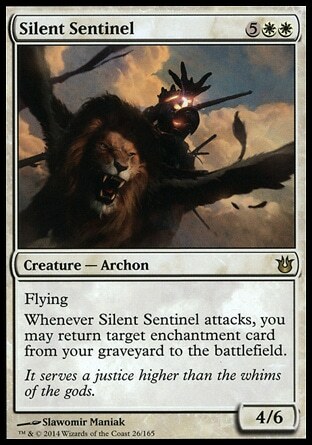 With Sigil of the Empty Throne out, netting a 4/4 angel with every Wings cast makes the card almost seem playable! The power of the gods can’t be denied and that is certainly apparent in Bruna v. 2.0. Not only are they enchantments, but they give the deck some potent abilities. The potential of having an indestructible body fairly early in the game is an enticing option. Let’s take a look at our eligible gods. 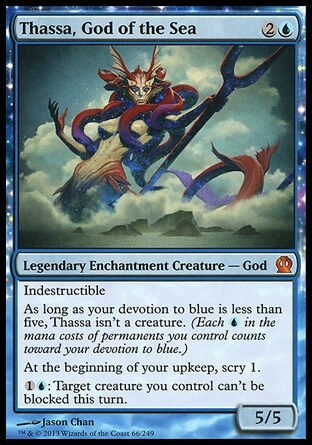 Thassa: We get a free scry every turn, which is never bad, and we can also give a host of our creatures unblockable, including Bruna in most cases. If we are suiting up or pumping up Heroic creatures, evasion is a great thing. 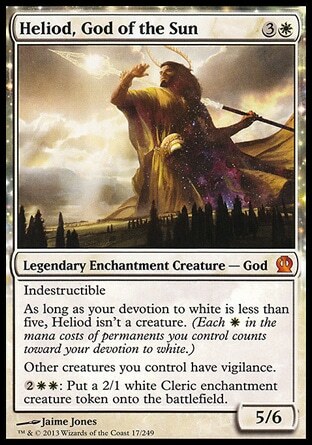 Heliod: Heliod lets us play some defense via Vigilance while still putting pressure on opponents. He also pumps out chump blockers or aura wielders depending on what is needed. I want to eventually Acquire a Serra’s Sanctum for this list, so the enchantment tokens will pay extra dividends then. They also help increase the effectiveness of cards like Sphere of Safety and Ethereal Armor. 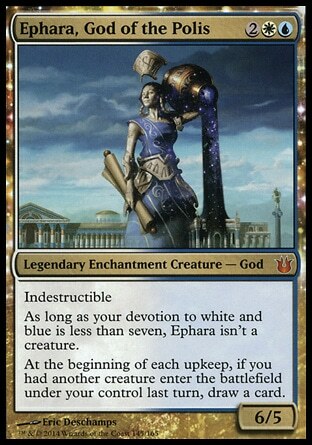 Ephara: I didn’t include Ephara since even with the reVisions, this deck isn’t exceptionally creature heavy. The card draw ability here unfortunately didn’t make the cut. I was hoping for more from you, U/W god. For Shame. Even though Ephara is a bit of a dud for me, Born of the Gods gave me more goodies to complete Bruna’s transformation. Here are some of the key Born of the Gods cards that will be making the cut. Silent Sentinel: Sun Titan is a great fit for this list, but Silent Sentinel opens up even more potential targets for recursion. He does cost 1 more than the titan and doesn’t trigger on entering the battlefield, but I am definitely going to give him a shot. Being able to resurrect a card like Eldrazi Conscription sounds like might be worth it. Plea for Guidance: This one is much more of a no brainer. Cards like Three Dreams can be backbreaking for your opponents if you resolve them, I expect Plea to be just as good, allowing you to fish out any two enchantments at once. You could go and get Sphere of Safety and Heliod or go right for two kill auras for Bruna. I can’t imagine many times when a double tutor would be bad. 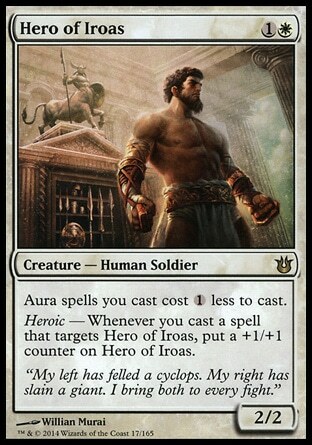 Hero of Iroas: Now we are talking. He pumps himself up when we stick auras on him and he reduces the cost of the rest of our auras. He’s a great addition to our Heroic creature stable. 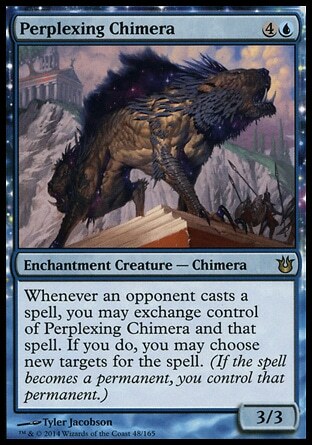 Perplexing Chimera: I am still not sure if this card is going to stand the test of time, but I’m willing to give him a test run since his effect is so whacky. I suppose his primary job is going to act as an extra layer of protection for bruna, but I could envision scenarios where he stalls the board out for a bit and allows me to set up a win condition. I’m just afraid he has “Play a Wrath Effect” tattooed on his forehead. I threw a Homeward Path into my mana base to try and get some extra value out of this dude. Yet again he is also an enchantment so he has the added card type synergy. Spirit of the Labyrinth: This is another card I’m not completely sold on since it shuts down our own cards like Memory Jar. It would be a good toolbox card to include vs. decks that want to draw a ton or vs. Nekusar. I might not cast it every game, but I think it’ll be a solid option to have in my back pocket should I need it. I cut back on some of the control elements in the new build. I also feel this new list will be less reliant on Bruna to close out games. I can envision games where I have a couple of smaller beefed up creatures swinging in for damage long before I’m ready to cast my commander. Hopefully this adds some variety to the deck as games play out differently depending on how my early board develops.